This has been one adventurous week in the kitchen and today I scaled new heights of hipness. I made cauliflower chicken wings! 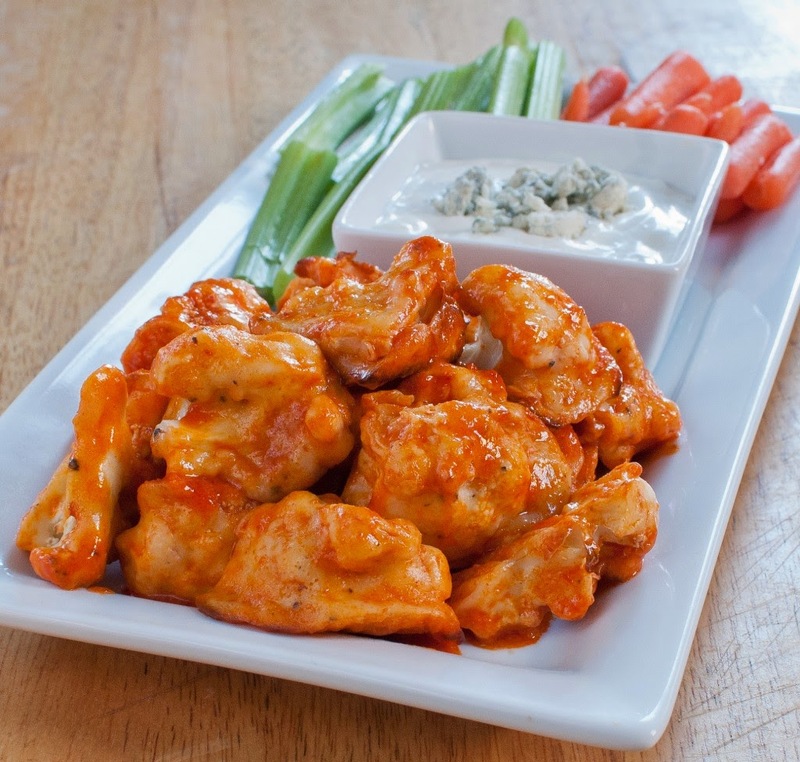 You know, Buffalo wings that are actually cauliflower. Cauliflower is the hip new vegetable and I have always loved it, and this idea has been going around the Internet. I had this really good blue cheese from Lorigo's and I decided this recipe had to be tried. There are a bunch of recipes floating around. But I noticed that a lot of them are simply roasted cauliflower that you dip in blue cheese. That is nothing new. I roast cauliflower all the time and sure, you always coat it with a little bit of olive oil and whatever else. I wanted something more radical. You mix in a big bowl: one cup flour, one tablespoon garlic powder, one teaspoon paprika and one cup water. Like paste, ick, except it's really not that bad, it's more like a loose bread dough. Then, gotta love this, "Add salt and pepper to taste." Thanks a heap, you know? I hate when recipes do this. How am I supposed to know how much to add? I am not going to be tasting this before I cook it. So I threw in a teaspoon or something of salt. You separate a cauli into florets and then you roll them in the bowl with this goo. This took some doing. The substance did not want to stick. But I finally got it pretty well distributed. Then you are supposed to spread the florets on a cooking sheet covered with foil and cooking spray. I do not buy cooking spray. It is unappetizing and the cans gum up and besides I have enough expenses. So I buttered the foil lightly. Then you roast for 15 minutes at 400 degrees. Turn the florets over and roast for another 15. Meanwhile they say mix a cup of hot sauce with a tablespoon of butter. After that second 15 minutes, you pour the hot sauce mixture over the cauliflower and mix it up again. Yeah right as Leonard Pennario used to say. It is a job. Then you bake it for another 5 or 10 minutes. I did overcook them. Somehow they wound up in the oven for an hour while I took a shower and improvised on Mozart and worked on the book. But I did not regret the long baking time. It is a funny thing with cauliflower, I know it should be crunchy for this recipes purposes but I do not like it crunchy. I want it cooked. The floury coating added some crunch. If you deep-fried the cauliflower that would be closer to the real thing. Like Tempura. But we are not going to do that, are we. One thing makes this recipe a hit. Who among us Buffalonians would not happily eat cardboard if it were dipped in blue cheese and served up with carrot and celery sticks?